Traveling is all about being inspired, having new experiences and collecting unforgettable memories. And all of that starts with acquainting yourself with your destination! Are you ready to discover a few key facts about Santo Domingo? 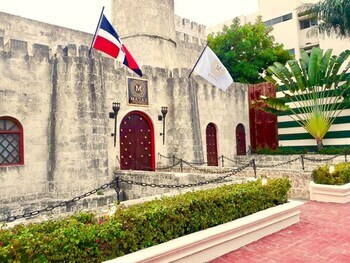 Santo Domingo is the national capital city of Dominican Republic. It's also about 85 miles (137 kilometers) southeast of Santiago, a notable city. This area of Dominican Republic has a population of roughly 2,200,000 people. If you're organizing a vacation in Santo Domingo, you'll want to hear this! 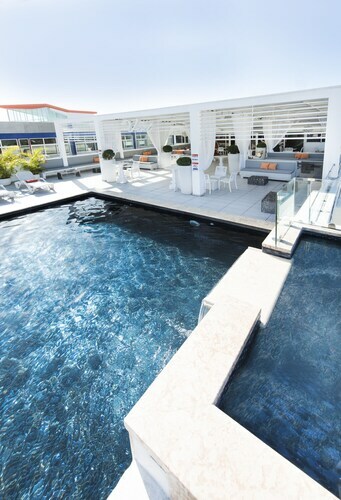 It's possible to save heaps of money with a Travelocity accommodation and airfare package deal. Just select from more than 400 airlines and 665,000 places to stay. Way too many choices? We'll make it simple! Are you looking for a worry-free adventure? Our Customer 1st Guarantee gives you 24/7 personal assistance on all our services. Discovered a better deal elsewhere? We'll meet the price and refund the difference^. We'll never make you pay any hidden fees if you alter your bookings. And so long as you get in fast, most accommodations won't charge you either^. Whether you're the sort of traveler who likes taking the path less traveled or you're inspired by those legendary sights, you'll find the ideal place to stay in Santo Domingo. 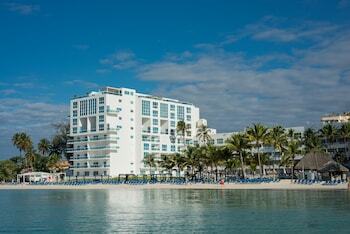 Dominican Republic's appealing capital offers 99 properties to select from. Plush rooms, luxurious sheets and sophisticated service is what you'll find when you book the JW Marriott Hotel Santo Domingo (Winston Churchill Avenue No. 93,ensanche) or the Casas del XVI (Calle Padre Billini No. 252). If you're simply looking for a cosy space to catch those Zs, don't stress! There are options for you too. The Hotel Doña Elvira (207 Padre Billini) and the Casa Naemie (CALLE ISABEL LA CATOLICA #11) are some budget alternatives. Where do you fly into for Santo Domingo? Say hello to wonderful adventures in Santo Domingo. Once you've headed out of Las Americas International Airport (SDQ), the center of town will be just 15 miles (24 kilometers) to the west. Can I rent a car in Santo Domingo? Wander the streets in Santo Domingo and experience the distinct culture. If you plan to explore a little further out, renting a car via Travelocity will definitely help. Collecting a car right at Las Americas International Airport means that you don't have to bother with transfers and cabs. Two of the best options include Ace and Economy Rent a car. If you're all for ease and convenience, look into Hertz at Jose Maria Heredia 1. It's right in the center of the city. Ardent sightseers will want to explore Alcazar de Colon and National Palace. Need more things to do in this bustling city? Cathedral of Santo Domingo and Parque Colon should keep you occupied. Excited by the mysterious aquatic world? Meet amazing animals and uncover the mysteries of our planet's vast blue waters at National Aquarium. Need some more ideas? You'll want to get on your most avant-garde attire when heading to Palace of Fine Arts. Facilitating an array of performances, festivals and events throughout the year, it's a vital part of the cultural landscape. And that's not all there is. Theater can challenge our beliefs and asks us to aspire to greater things. See a production at National Theater and open your mind to some new ideas. If you have a spare day and you're happy to travel 19 miles (31 kilometers), check out Boca Chica. This happening destination has loads of things to see and do. Begin uncovering the culture and character of the region at La Caleta Park. 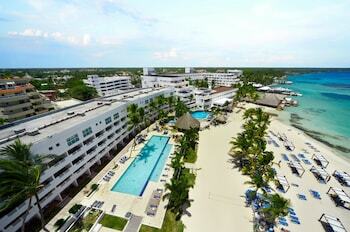 If you'd like to discover more, stop at the Nautical Club of Santo Domingo and Dream Casino Be Live Hamaca too. Juan Dolio is another nearby destination located just 30 miles (48 kilometers) away. 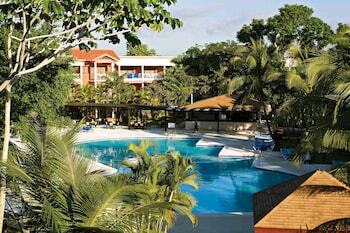 This place offers the Guavaberry Golf and Country Club, the Los Marlins Golf Course and Guayacanes Beach. 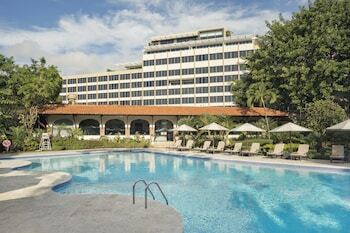 Located in Miraflores, this hotel is within a 15-minute walk of Museum of the Dominican Man and Embassy of the United States Dominican Republic. Blue Mall is 3 mi (4.8 km) away. Juan Bosch Station is 16 minutes by foot and Casandra Damiron Station is 19 minutes. Located in Juan Dolio, this beachfront property is next to a golf course, 1.4 mi (2.2 km) from Los Marlins Golf Course, and 3.1 mi (4.9 km) from Guayacanes Beach. Guavaberry Golf and Country Club and Estadio Tetelo Vargas are also within 9 mi (15 km). Located in Ciudad Universitaria, this luxury hotel is 0.6 mi (1 km) from Convention Center Ministry of Foreign Affairs and within 3 mi (5 km) of National Palace and Centro Olimpico. Cathedral of Santo Domingo is 2.2 mi (3.6 km) away. Amin Abel Station is 12 minutes by foot and Joaquin Balaguer Station is 14 minutes. 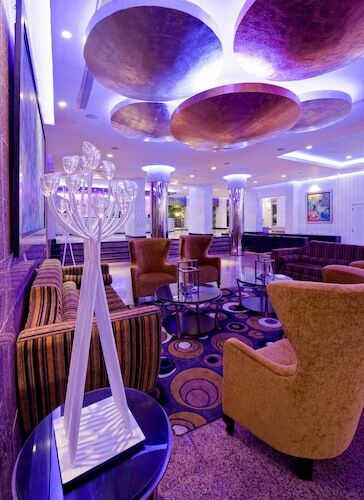 This family-friendly Santo Domingo hotel is within 2 mi (3 km) of Plaza de la Bandera and Santo Domingo Country Club. Guibia Beach and Blue Mall are also within 6 mi (10 km). 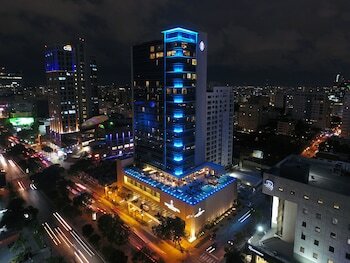 This New World Discovery has prime location next to the business and trade area of Santo Domingo. 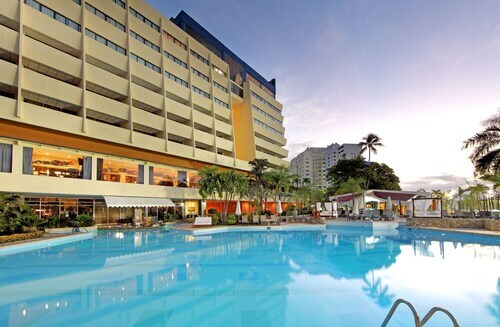 El Embajador is a luxury hotel with easy access to major tourist attractions and entertainment venues of the city. 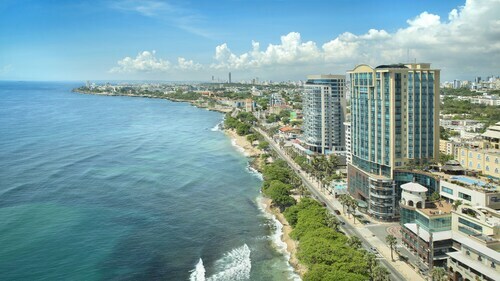 Located in Downtown Santo Domingo, this hotel is 1.1 mi (1.7 km) from Blue Mall and within 3 mi (5 km) of Embassy of the United States Dominican Republic and Guibia Beach. Sambil Santo Domingo and Jardin Botanico Nacional are also within 6 mi (10 km). Francisco Alberto Caamano Deno Station is 19 minutes by foot and Heroes Center Station is 24 minutes. Located in the heart of Santo Domingo, this spa hotel is within 3 mi (5 km) of Acropolis Center, Blue Mall, and Embassy of the United States Dominican Republic. Convention Center Ministry of Foreign Affairs and National Theater (Teatro Nacionale) are also within 3 mi (5 km). Heroes Center Station is 25 minutes by foot and Francisco Alberto Caamano Deno Station is 29 minutes. 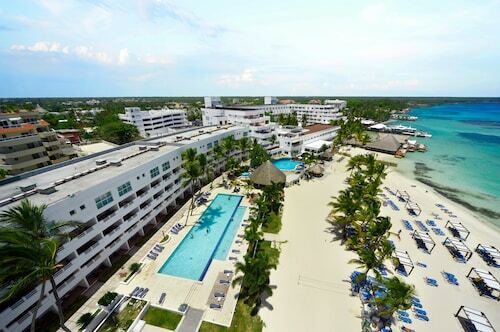 The hotel has an oceanfront location at Boca Chica, beach with crystal clear waters and white sands, and is located only 30 km from downtown Santo Domingo and the Colonial City.